Learn how to create Slider in ASP.NET using AJAX? 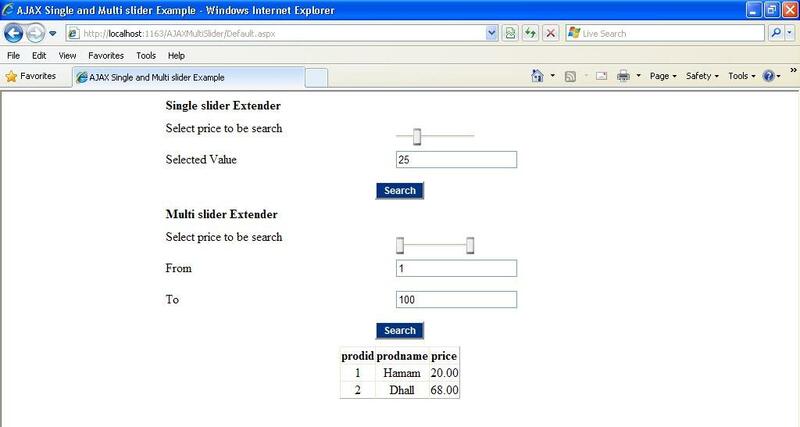 Here I gave detailed explanation how to use single and multi handler slider in ASP.NET using AJAX slider control. Follow the below explanation and source code. In the client side of the page I have create two slider control one for show single slider in web page and another is show example of multi slider in your webpage. Single slider is used to show only single selected value in textbox, so we can get product from database from minimum amount to entered amount. &LT;td height="40" align="center" colspan="2"&GT;&LT;asp:Button ID="Button1" runat="server"
If we use MultiHandle slider is show two or more slider in a web page for user select values like from and to price. &LT;td height="40" align="center" colspan="2"&GT;&LT;asp:Button ID="Button2" runat="server"
Download the attached source code and try to learn AJAX Slider control and its uses. I hope this article is help to know about AJAX Slider control in ASP.NET.